Help us kick off the spring season at 806 Arendell with DIY skiff bird feeders on the porch Monday, April 22, from 10am—2pm. Help us kick off the spring season at 806 Arendell. The Core Sound Quilters will be on the porch working on their 2019 quilt. Join us! Help us kick off the spring season at 806 Arendell Street. Join some of Core Sound’s best carvers on the porch Wednesday, April 24 from 10am - 2pm. Help us kick off the spring season at 806 Arendell Street with a week of porch talks. Join writer Deborah VanDyken and illustrator Susan Mason for a book signing and reading of The Little Turkle at 2pm on Thursday, April 25. Help us kick off the spring season at 806 Arendell Street with a week of porch talks. Bring the kids for story time with Miss Teresa on Friday, April 26 at 10:30am. Annual summer time shrimp fry and bake sale return. The perfect stop off on your way to the Cape. SAVE THE DATE – This year’s celebration will be bringing together the descendants of Shackleford Banks who migrated to Salter Path, Promise Land and Harkers Island to celebrate the 120th Anniversary of the Storm of 1899 that drove their Shackleford Banks ancestors to higher ground. A family-friendly 10K, 5K and Fun Run on one of North Carolina's most beautiful islands -- Harkers Island. The Core Sound Run begins and ends "at the end of the road" - at the edge of Core Sound. Join us for the annual Taste of Core Sound this year graciously hosted by Southern Salt in Morehead City. Vivian Howard, award-winning TV personality, chef, and restaurant owner, is joining us to sign copies of her New York Times Best seller, Deep Run Roots. In time for Christmas, a personalized copy of Deep Run Roots is a gift someone will treasure forever. Calling all families, kids, parents & grandparents: Mark your calendar for fun times together the Core Sound Way! Core Sound is delighted to welcome local seafood ambassador, chef, and restauranteur Ricky Moore to this year's Summer Taste. The night and menu will be a mix of what you've come to expect from the Taste of Core Sound with a twist from the celebrated Durham icon. Summer Raffle Drawing Date…August 24. Tickets on Sale NOW….Get yours today! On Saturday, August 18th, Harkers Island and the entire Coast Guard Community, will honor Chief Ira Lewis with a parade, lunch and recognition ceremony led by Admiral Dean Lee, Keynote Speaker. Join the Core Sound Waterfowl Museum & Heritage Center community as we discuss our relationship with place, the role of change in our lives, and, if and how, it impacts our region and future. Bound by our saltwater connections, we’ll join our neighbors from Ocracoke, Hatteras, and the Chesapeake Bay in conversation about our day-to-day observations of change and how we might prepare for a more resilient tomorrow. Hey Boys and Girls: Come join us in the William E Smith Children's Area of the museum for another summer of Soundside Story Time! Each Friday morning we will read a couple books, do a craft activity, and then have snack time! The programs are geared for preschoolers and their caregivers! Please come join us! Free play after the "program"! Programming is from 10:30-11:30 am. Themes this summer include Welcome Summertime. Sound Life, Mermaids, Fun in the Sun, Friendship, and Ducks! Sea Ya soon! Join us for stories and activities that celebrate summertime and all the fun that comes with it! July 20: It “Sounds” like Fun! Come and share the beauty and mysteries of the marshes and sounds! A special watery world is all around us—let’s learn all we can! July 27: Fun in the Sun! We love the Sun! But do we really know what it does for us or how we can use it? Learn about the Sun and do some “cool” Sun projects! August 3: Mermaids Among Us! A special Friday the girls will really like! The ocean sparks our imagination – that just might include a mermaid or two! Come and find out if they might be swimming with you! We love our ducks here at the Core Sound Waterfowl Museum & Heritage Center! Come learn about our splashy little friends! Watch'em Carve Wednesdays have been happening for about a month now! If you haven't stopped by, come join us in David's Room, in the education hall of the museum, to watch some of our finest local decoy carvers create works of art, right before your eyes! They may even let you try it! Various carvers continue to be with us each week throughout the summer until mid August! We would love for you to join us! June 25-29 is geared toward rising 4th – 6th Graders. Limited space is available. Cost- $ 50 - Museum Members $60- Non Members Please contact Teresa Everett at teresaeverett@coresound.com to find out more about this exciting opportunity!! Core Sound is excited to announce the opening of Harm's Way - an exhibition that brings to life traditional community perspectives on hurricane response and recovery. 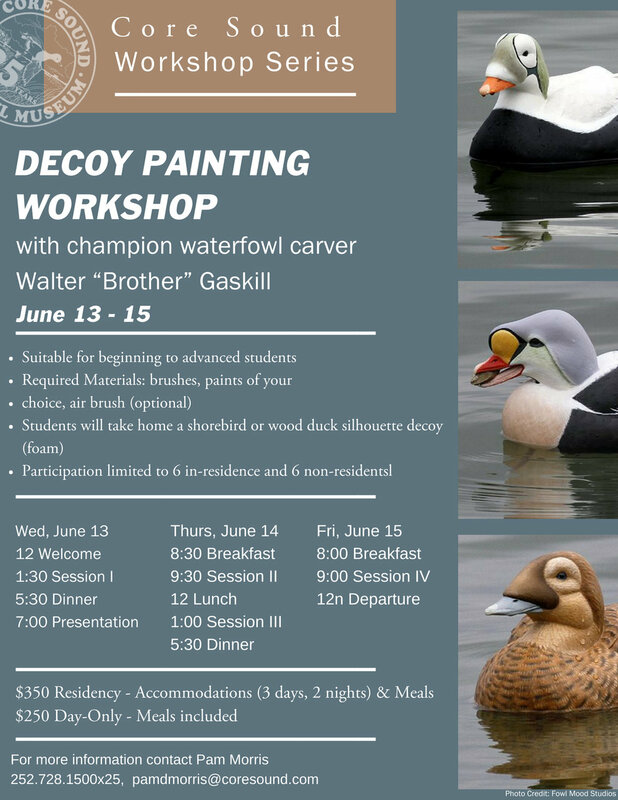 Come join us in David's Room, in the education hall of the museum, to watch some of our finest local decoy carvers create works of art, right before your eyes! They may even let you try it yourself!! Various carvers will be with us each week throughout the summer starting June 20th and running on through mid August! We would love to see you here! June 18-22 is geared toward rising 1st- 3rd Graders. Limited space is available. Cost- $ 50 - Museum Members $60- Non Members Please contact Teresa Everett at teresaeverett@coresound.com to find out more about this exciting opportunity!! Bring your bench, your vice, your shaving horse, or whatever you have to hold that bird and shave some wood with us! You will also have the chance to enter or simply enjoy the Kent Hood Memorial Core Sound Hunting Rig Competition taking place at the same venue! Down East Earth DayI Come join us for our 3rd annual "Down East" Earth Day at the Core Sound Waterfowl Museum and Heritage Center! We will have interactive programs and activities from 10 until 2 on Thursday April 19th! Join a "Walk n Talk" on our Willow Pond Trail, investigate our restored wetland, or learn about amphibians and macro invertebrates. Help sort materials for recycling, learn about pollinators and make a recycled newspaper pot for a seedling! We will have honeybees to observe, and rangers from the Cape Lookout National Seashore will join us as well! This is just a sample of things you can see, learn and take part in! It's FREE!! A family-friendly 10K, 5K and Fun Run on one of North Carolina's most beautiful islands — Harkers Island. The Core Sound Run begins and ends "at the end of the road" — at the edge of Core Sound. Please submit the form below to request a spot. Please note: space is limited. A museum representative will reach out to confirm your registration. Special Edition of Soundside Storytime - Dr. Seuss Day! Dr. Seuss Day at the Museum! Hey Boys and Girls: Come join us in the William E Smith Children's Area of the museum to celebrate Dr. Seuss' Birthday! We will read several of his books, do an activity, craft and then have some special "Seuss Snacks"! The program is geared for preschoolers and their caregivers! Please come join us! Free play after the "program"! The 2018 Winter Taste will feature a feast of fresh seafood and wild game that honors old club food traditions from the legendary Pilentary to small camps across Core Sound, a program on Clubhouse Decoys, & auction events. Get your tickets before they are gone. One of Core Sound's most highly anticipated events! A entire weekend dedicated to celebrating Down East history, traditions, and community spirit. The weekend will kickoff Friday night with a ticket preview party, followed by two days of wildlife artists, decoys carvers and collectors, model boatbuilding and other crafters selling their wares, plus boat building , oar making, & retriever demonstrations, plus local seafood, children's activities, and much more. Eleventh and final in the 2017 25th Anniversary Celebration Core Sound Community Night series featuring Harkers Island. A cover dish dinner begins at 6pm followed by the program by Carteret County historian Rodney Kemp at 7pm. Free event. Ho! Ho! Ho! It's that time of year! We are having our annual Santa's Workshop for kids ages 4- 10. We will have holiday crafts as well as snacks at Mrs. Kringle's Kitchen! You can write a letter to Santa too! And.....Elf Mart will be returning! In exchange for a canned good, CHILDREN may choose ONE gift for their parents and get it wrapped to keep it a surprise! Come join us! Join the Down East Library for a fun night at their Bingo Fundraiser held in the Core Sound Museum Education Hall! the fun starts at 5:30pm until about 9pm. Hot dogs, drinks and snacks are available for purchase.